Hiking Highlights: The Chimney Rock State Park: Rumbling Bald Climbing Access is located in Lake Lure, NC. It is known for rock climbing and bouldering. Climbers come from all over the country to experience the challenges this park provides. Not a climber — this park is still a beautiful hike and offers the added bonus of watching people enjoying the sport of climbing. 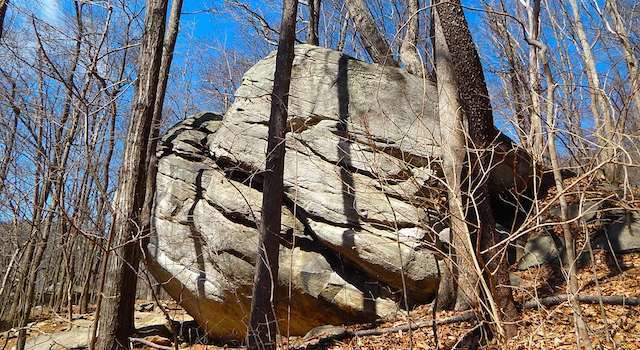 Hikers will also be able to get a unique perspective of Rumbling Bald Mountain from the base of its’ granite rock face. As always, views of Lake Lure and surrounding mountains are best after leaves have fallen from surrounding trees. PLEASE NOTE: This park is a FREE entrance and not to be confused with the Official Chimney Rock Park which does have a fee for admittance. Map & Directions: 827 Boys Camp Road, Lake lure, NC 28746. From the Lake Lure Beach, head west on Memorial Hwy. (64W) for 6/10 of a mile. Turn right on Boys Camp Rd (just past Flowering Bridge). Follow Boys Camp Rd. 1.3 miles to entrance of Park on the left. Trail Challenges: When exploring side trails, you will come across some minor climbing requirements – some side trails are less obvious as you head toward the face of the mountain – at the end of the trail loop, there is a giant washout that takes some finesse to get through. Dog Friendly: Yes, but just a warning – dogs are supposed to be on a leash no more than 6 feet long. The State Park Rangers do patrol the park and have been known to issue tickets to owners with dogs off leash. About the Hike at Chimney Rock Climbing Park: While the Rock Climbing Park is part of Chimney Rock State Park, it is not located within the main park (see directions below). This is a good thing — this park is FREE! 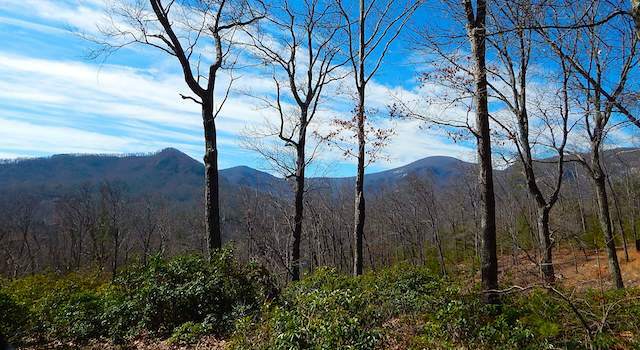 The park consists of 1,100 acres on and around Rumbling Bald Mountain and has numerous cliffs and boulders. The park is world renowned to boulder and rock climbers and several books have been written to assist climbers with the parks extremely technical obstacles. Start the hike at the obvious trail head at the top of the parking lot. When you reach the bottom of the first hill (125 yards) you will notice the huge washout to the left of the main trail. That is your exit at the end of the trail loop. For now, head down the gravel trail marked with orange trail marker disks on trees. 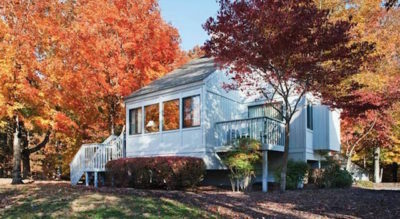 As you ascend the gravel trail you will begin to see glimpses of Lake Lure through the trees (view is much better in winter). After 10 minutes on the gravel trail it turns to dirt. 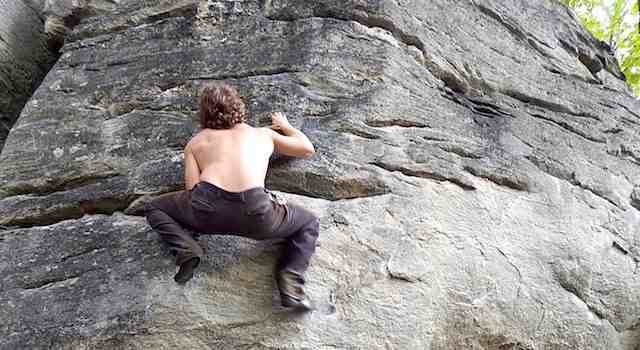 Another few minutes and you are at your first boulder climbing area. From here the trail gets a little more difficult. Head around the left side of the small loop at this first builder patch and you will see stone stairs heading up a somewhat steep incline. Now you’re in the fun section of the trail. As you continue, you will notice smaller trails shooting off to the right of the main trail. Each of these smaller trails leads to climbing boulders and/or Rumbling Bald’s granite face. This hike would not be complete without exploring some of these side trails. You really can’t get lost … so explore. But, please realize that some of these trails require some climbing. Don’t put yourself in a dangerous position. For the purposes of this post, the hike characteristics are only based on the main trail loop – no side trails. As you continue on the main trail, you will pass 3-4 more boulder climbing areas. You can tell these boulders are popular with the climbers as there are numerous white chalk marks all over the rocks. I you run across climbers and would like to watch – just ask. Climbers tend to be more than happy to have spectators. A little further up the trail you will notice it widens and then forks. Veer left to head back towards the parking lot. Now you are about to reach 2 washouts – one smaller – one larger. This is the way out. You can walk around the first and then head down but the second you have to climb right in. Once through the second washout, you are back on the gravel trail that leads to the parking lot. Check out pictures and more videos from the recent Triple Crown Bouldering Event held at the park. 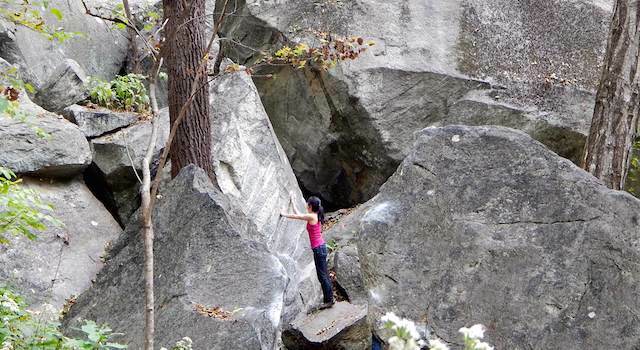 We hope you enjoy this fun Lake Lure trail at Chimney Rock Climbing Park. Who knows, this hike could spark your interest in a new sport – boulder or rock climbing!